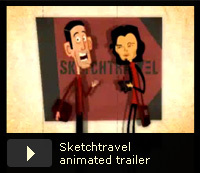 Sketchtravel is a unique artistic adventure instigated by two artists, Gérald Guerlais and Daisuke Tsutsumi. They bought a sketchbook in 2006 and asked illustrators around the world to draw in it, and transmit it to the next artist. The final sketchbook, with drawings from 71 artists including Quentin Blake, John Howe, Bill Plympton and Hayao Miyazaki, will be sold at auction on the 17th October 2011 with benefits donated to the non-profit organization "Room to read". A published version will be available for sale in bookstores from the 5th October 2011 in France, and in Spring 2012 for the US and Japan. is a collection of videos and portraits about the international project Sketchtravel. Enjoy, follow and share our videos.